I know many of us are gearing up for fall, and I’m looking forward to lots of fall baking…. 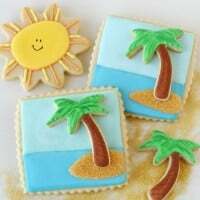 but I have a few more desserts to share from last weeks’ Luau party before I dive fully into fall! So let’s relish in just a couple more bright summery treats…. For these colorful cupcakes I used my favorite Vanilla Cupcake Recipe and Chocolate Cupcake Recipe, along with my Vanilla Cream Cheese Frosting. I used pretty, colorful liners from Confectionery House (I have a full post HERE on my favorite cupcake liners, and liners that keep their color after baking). 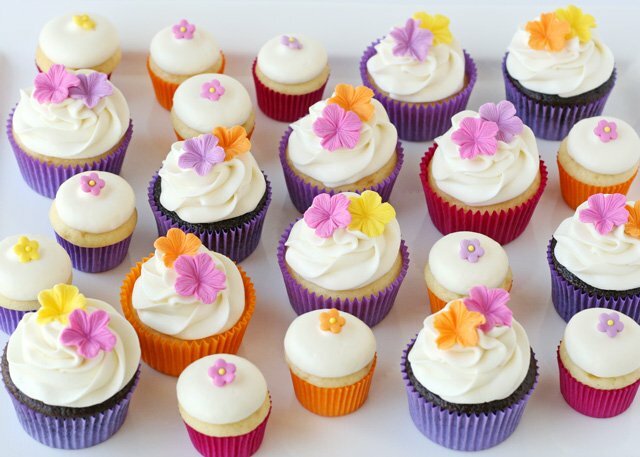 I decorated the cupcakes with the Fondant Flowers I shared how to make last week. The large/standard sized cupcakes I frosted using a Wilton 1M tip. 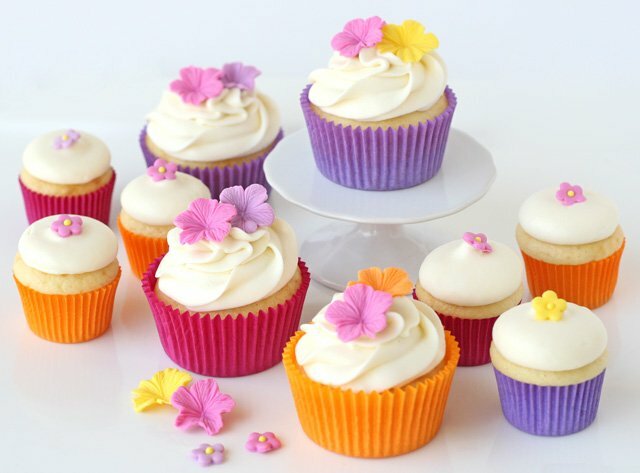 I have a full post on How to Frost Cupcakes if you are new to cupcake decorating. For the mini cupcakes, I used a large round tip (with about a 5/8″ opening) and simply held the piping tip above the center of the cupcake (about 1/2 inch from the surface of the cupcake), gave a good squeeze, then stopped squeezing and pulled straight up. Then I added a little fondant flower on top of the frosting tip. By preparing fondant flowers ahead of time to match the occasion, then using pretty, colorful liners, this simple style could be adapted to fit most any color scheme or occasion. These are super cute . Love the colors, so happy and cheerful. Made me smile. Just taking a little 5 minute break from painting. Hope you are having a lovely weekend. 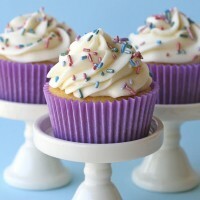 I love the colors of the cupcake liners and how the style of frosting differs. Very Beautiful. No sabría cual coger y comérmela con un buen vaso de leche. These are very sweet and girly looking, I like it! Beautiful lighting in your images too. Fabulous color combo! Would be lovely for any summer or spring outdoor celebration, not necessarily a luau! Beautiful…I just ordered the flowers cut set, I’m in love on how the flowers look. 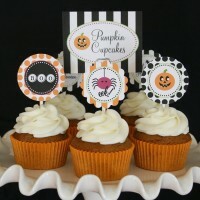 The mini liners I used for the cupcakes above are from Confectionery House (as linked in the post). 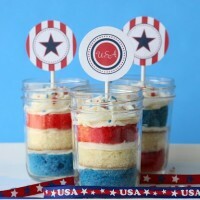 They are standard, (U.S. sized) mini cupcake liners. Mini cupcake pans (in the U.S.) are usually standardized as well… you should be able to buy them at any major craft store (Michael’s, Hobby Lobby) or kitchen store (such as Bed, Bath and Beyond). Mini cupcke pans and liners are quite small…. most of the time I would rather just make standard sized cupcakes, because they’re almost the same amount of work! Best of luck with your event! So fun! Love all the colors. 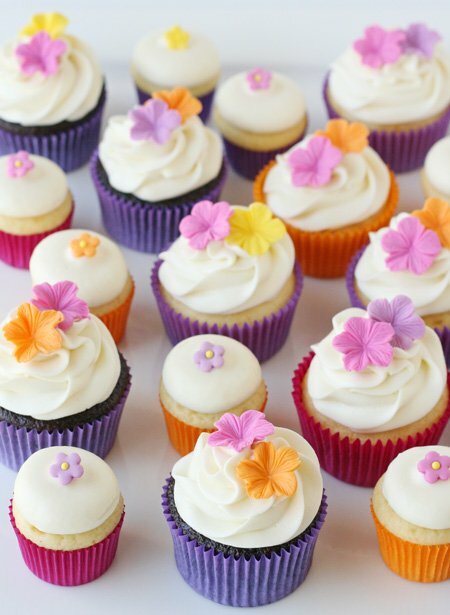 Your photos are as gorgeous as your cupcakes! Everything is beautiful!!! These are so pretty and cheerful! You picked some great colors, great work Glory! Great work. So pretty and lovely. I love all the colors. Decoration is clean and perfect. Lovely decorating tips! You simply have a wonderful blog. Can you please tell me where you get the bright colored baking cups? They bake so well! Hi Catherine, The source (Confectionery House) is mentioned at the top of the post.